Holy shiitake mushrooms! I'm still fangirling over this book. I'm trying to pull myself together to write a coherent review. So here's to hoping this makes sense to anyone other than myself! First of all, after reading Obsidian I was desperate to get back into Katy's world, but I was a little hesitant at the same time. I feel like this a lot when it comes to series because even though there are so many fantastic series, there are also a lot that only the first book is worth anything. I'm happy to say that Onyx is just as good as Obsidian!! All of the things I loved about Obsidian are still present in Onyx. Katy is still an adorable (and easy to relate to LOL) book-obsessed blogger. 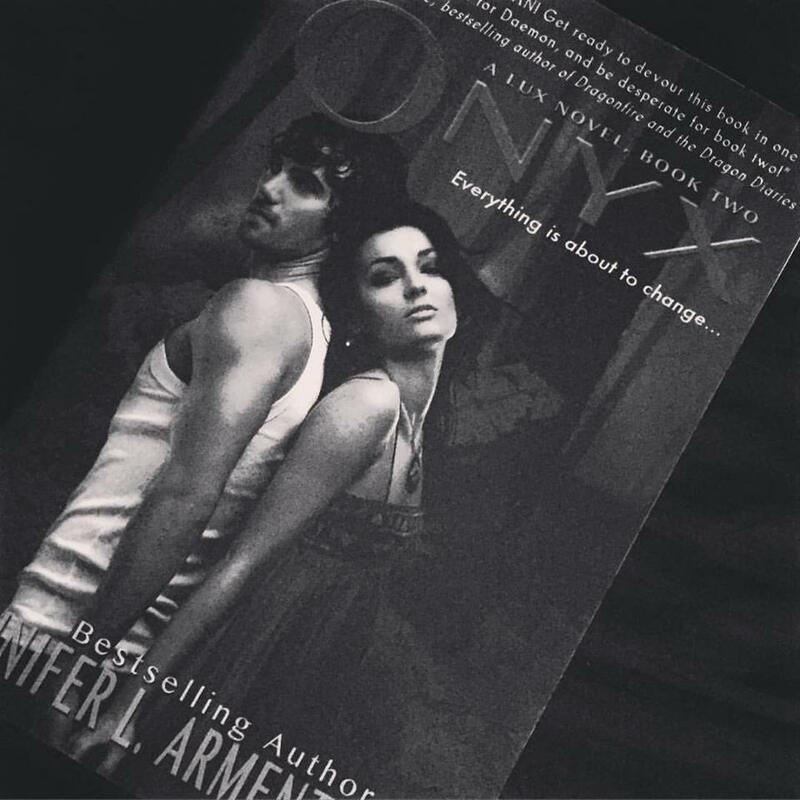 Daemon is still a fiery/jerk/hot/protective alien and the romance between him and Katy is still scorching hot!!! I still say the Lux series is like Twilight with aliens, but with way better writing. I can't get enough of this series! What I enjoyed most about Onyx is that we get way more information about the Luxen, Arum, and the DOD. Let me just say things are pretty crazy and there are some great twists in this one. I literally read this one in under 24 hours. I devoured this one just like I did Obsidian. Arementrout's writing is very addictive and even though their styles are different, it reminds me of how addicting Colleen Hoover's writing is. I know when I pick up one of their books I will be hooked from page one! Wow. The ending to this one really left me wanting (needing) more of the Lux series. I'm going to wrap this up now so I can get to reading Opal! Overall I loved Onyx and this series is fast becoming a new favorite. If you haven't started it yet then do yourself a favor and pick it up!! I recommend it for everyone. I love when you fangirl forever after finishing a book! Glad you enjoyed this one so much! I loved this series until JLA posted a spoiler of book 3 over facebook only a few months after it was released. It was a shock because she didn't mark it and even though I read the book I couldn't stop thinking about it and I somehow started losing interest. Anyway, I'm so glad you're loving this series! Maybe someday I'll read the last two books. I so need to pick this series back up! So glad you loved this as much as you did book one! Thanks! I sure do love her writing style. That addictive-ness makes it so fun to read! I like this series because It's fun and easy to read. There's really nothing special about the writing, but I like that it can hold my attention. I've only gotten to book 3, but I do plan to read the next one soon. I think the reason I'm not head over heals is because it has that Twilight feel, and JLA seems to just stay in the safe zone when writing. If it weren't for Daemon, I'd have stopped after the first book. Still, I can't deny that the books are addictive. I really liked the first book so I probably need to jump into the rest of the series in the very near future! Nice review, glad you're having so much fun with this series! Great review! Love this series and need to re-read it soon! Don't worry, there will be more Dee!! I'm so glad you loved this book! What I remember most about this series was how fun it was to read and the adorable romance between Katy and Daemon! I LOVED this book! This one and Obsidian are my favorite of the series. JLA is an excellent writer! Things just get more and more complex, which really added depth to the series. I'm so glad that it gets more complex. I really love that in series. Hope you have a great weekend too! Thank you for visiting my blog! I read every comment and reply back to all of them. I also try very hard to be sure and comment back on your blog as well. I Did A Thing...I Published A Book!